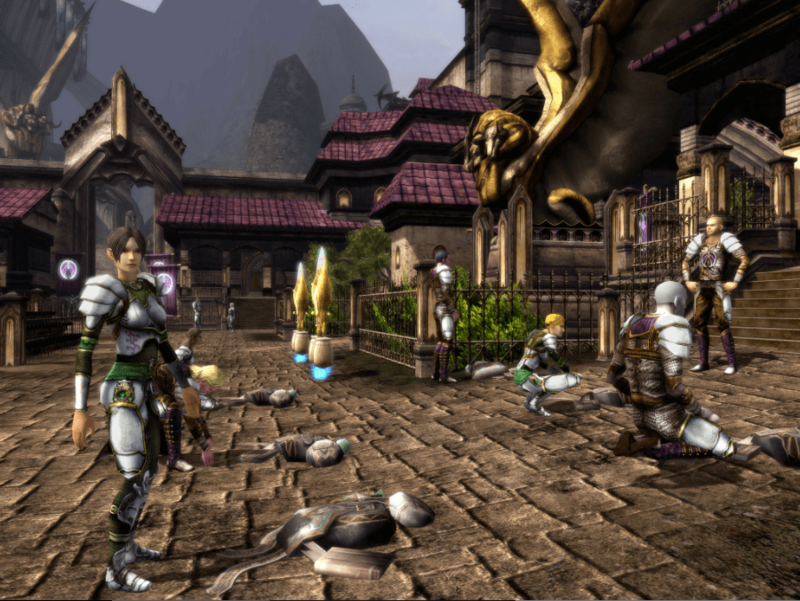 DDO Unlimited image, Turbine Inc.
Dungeons and Dragons Online: Unlimited is a free to play MMORPG offering the rich world and mythos of Dungeons and Dragons in a neat little MMO package. Players can download and play the game for free and use the pricing model to buy extras like adventure packs, items, additional account services, etc. Players can also subscribe to get unlimited access, if they so wish. 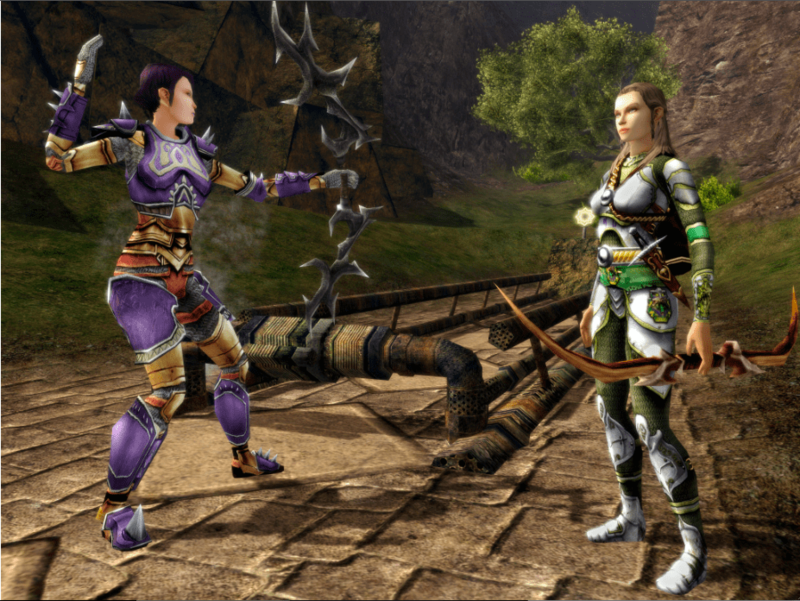 DDO Unlimited sees the arrival of its fourth update, which adds the new “Sentinels” adventure pack, and plenty of new items to the DDO store. The Sentinels adventure pack introduces a series of five adventures revolving around the sea. Players join the Sentinels and attempt to defeat a pirate threat. Developer Turbine introduces this new update alongside the unveiling of the “DDO Player Feed”, a Facebook application available to DDO subscribers. This application features player blogs, character info, kinship pages, etc., to allow players to keep in touch with the game when they aren’t actually in-game. Social networking is a growing and powerful medium than many companies are attempting to tap into. The World of Warcraft Armory and Mobile Armory, and Gamekiss’ Valkyrie Sky networking event come to mind, in recent memory. The DDO game store expansion sees the addition of several new items, such as guest passes for the Sentinels adventure pack, +2 Character Bank Slots, +3 Greater Reincarnation, and other goods. WWD May 28, 1999 | Lockwood, Lisa NEW YORK — Back in the old days, when a fashion executive wanted to advertise his collection for the fall season, he’d call a few magazine reps, haggle over page rates and pressure for position. That would be the media plan for the season. Fashion advertisers are faced with an overwhelming abundance of media choices, each with its very own niche. There’s a proliferation of fashion, beauty and lifestyle titles to consider — from the tastefully upscale to the bodaciously lewd. Then there are the general interest, entertainment and teen magazines; scores of downtown, alternative titles; outlets for women over 40 or large-sized women; ethnically focused franchises; magazines on food, travel, fitness, parenting, cigars, wines, music…and so on. And what about all those regional publications? Then there’s outdoor advertising. Should the plan include billboards, painted walls, buses, phone kiosks, skywriting or wild posting? And in which cities? How about radio? Is there enough money for cable and network TV? And if you’re a player, you’ve got to be on the Internet. But which sites are the most desirable? How about sponsorships? Should you sponsor Lilith Fair, or tie in with Madison Square Garden? All these outlets, and then some, are competing for the fashion advertiser’s buck. Pity the poor media planner; developing a media plan — and negotiating and navigating through all the added-value programs — has become an increasingly complex undertaking. Even Calvin Klein, who’s usually a step ahead of just about everybody in the ad game, is boggled by the complexity of today’s media buy. “It’s harder. The process keeps changing,” said Klein. “When we do fragrance ads on TV, there are so many options. I used to pick the spots on TV when we did the Brooke Shields campaign — it was simple. Now there are so many choices with people watching all kinds of things. There’s the Comedy Channel, ESPN….And in print, it’s not like there’s one book that you can’t live without or is the magazine of the moment. It’s a time of choices and options. There’s lots of good stuff around.” WWD polled advertising and fashion executives about their media buys today. How do fashion marketers decide which media to choose? When do they determine if it’s time to change the mix? How do they judge what’s working, and more important, what isn’t? Are they confused by all the options? Do all the choices dilute a brand’s image? “In today’s environment, you have to be targeting the different groups. You want to speak to your consumer through media vehicles that are relevant, impactful and believable,” said Peter Connolly, executive vice president of marketing at Tommy Hilfiger Corp.
“If a woman looks at an ad in Vogue, by virtue that it’s in Vogue, it has more of an impact on her,” he said. “Where your brand is, is as important as the ad itself. “If you’re trying to raise quick awareness for a new brand, then you might want to go with outdoor. To sustain an existing business, such as sportswear, you want to go into the core fashion books,” said Connolly. “For this business, print is the core vehicle.” Hilfiger has taken advantage of many of the added-value programs magazines offer, ranging from retail appearances by Tommy Hilfiger or rock stars to book signings, appearances by Nickelodeon’s Keenan and Kel and Britney Spears on tour. “We do lots of promotions. They work out well because of the [magazines’] association with the brand. It helps the magazine and it also helps us,” he said. But how much can a company try in one season? “As many wild ideas as we can,” said Connolly. “We see a couple of proposals a week. You have to try new things because you have to be fresh.” For fall, Hilfiger will do an editorial onsert with a musical theme with Vogue and GQ. This is Hilfiger’s second onsert with Vogue; the first was in March. Twenty-six pages will be advertising, including the fragrance launch ads, and another 26 pages will be editorial. Hilfiger isn’t advertising on anyone else’s web sites yet. “All our efforts will be on our own web site that launches this fall,” Connolly said. “The truth is, most magazines, if they’re good and we have a partnership, come to us with great ideas. The really good magazines are up on your business and know what your initiatives are. We keep them engaged in it.” South noted Polo avoided advertising gimmicks and wasn’t a big believer in onserts. “Ralph believes very strongly that if you believe in the magazine, your ads should be in the magazine.” The company has been successful advertising in vertical publications for RLX, its authentic activewear line, South said, adding that the label had advertised in niched titles such as Runners’ World and Bikers World. Asked how he evaluated whether a magazine was working, South replied, “We’re a branded company. We’re selling brands. We don’t measure it by whether we sold 50 sweatshirts. You look at the books as a whole. [But] obviously you want to sell product.” While magazines represent the biggest piece of Polo’s media buy, the company relies heavily on outdoor for categories like jeans. “For certain categories, such as designer, we don’t do any outdoor advertising,” he said. “For outdoor, we feel the ones that are most effective are the large-scale ones which allow you to stop and pay attention.” “Yes, it’s difficult because there are so many options today,” said Dawn Jacobs, senior vice president of CRK Advertising, the in-house agency of Calvin Klein Inc. “We give very serious thought to who we support and how effective it is. We’re always looking for alternative media. The options make the process more complicated, but also more exciting.” Jacobs said Klein has “long-term relationships with certain publications. “We also hold open a portion of each season’s media budget for placements in new publications that help target specific audiences.” Asked which new magazines have performed well for the company, Jacobs said, “There are a number, but I think the biggest story is Maxim and its tremendous circulation rise.” She said the firm would ask a magazine for added-value programs. “More and more, it’s about a partnership. We always look for premium positions — but also related promotions and events. For example, a college tour related to one of our campaigns.” Trey Laird, senior vice president of advertising and creative services at Donna Karan International, said it was imperative to have a clear picture of Karan’s customer. “You have to focus on a target and know who you’re going after to build a successful group of programs.” “I think for fashion, you get the most value in print right now. When you’re dealing with the population we’re dealing with — even DKNY, our biggest brand — you get the most focused audience with magazines. As the audience grows, TV becomes more appropriate. TV is, bar none, the ultimate, but it’s not appropriate for our target,” said Laird. DKNY is considering TV for jeans and plans cable and network TV for fragrances. “Outdoor is still very effective,” he added. “It’s part of the urban landscape. Outdoor has totally taken on a cachet. When we started doing it 10 years ago, no one was doing it but packaged goods and cigarets.” The Internet is another area Karan plans to tap. “We’re going to try to be on the net for next year,” Laird said. “We’re linking up other sites. It’s a whole new industry to consider. We have nothing real specific yet. We’re working on designing ads for the web.” Laird also looks for added-value programs with magazines. “You have to maximize your partnership. You have to get beyond just taking a page and an insertion order. You have to take it to the next level,” he said, citing an onsert he did with Vanity Fair this spring. “Even with people new to the [media] plan, we’re asking to get involved in events or to tap into their subscriber list,” said Laird. “You work with events and tie-ins. You have to push it.” Laird said a fashion industry advertiser needed to evaluate the media mix every season. “I think it’s great to have so many options,” concurred Reed Krakoff, senior vice president and executive creative director of Coach. “We also have the windows of our stores. It feels right when they [the consumers] see advertising in different environments. They see it in the New York Times, in Vogue, on phone kiosks and in our store windows. It’s a cumulative effort, not just throwing some ads out there.” Krakoff believes there’s a method to the madness. “I think the first thing we do is determine what type of media makes the most sense for our product category and the type of consumer who shops for our product. Where are they most influenced? Magazines? TV? Online? Outdoor? It’s `What makes the most sense for us?’ more than `What’s happening?”‘ Most important, Krakoff believes “there are a million ways for it to work for us — there’s no right or wrong way.” To determine whether the media plan is working, Krakoff tracks Coach shoppers from research through mail-order receipts and in-store receipts. “We do back-end analysis,” he said. All the firm’s ads carry 800 numbers and the web site address. “When you have a new collection in May and have outdoor during that time period, and the line blows out of the stores, you get an idea of how things are doing.” Coach’s media mix combines direct mail, newspaper ads and regional pieces, “which are more tactical,” with national magazine ads that are the most image-driven. “It’s a broad-based umbrella approach,” he said. Coach also advertises outdoor in pockets of the country where there is a strong consumer base. Krakoff believes billboards and phone kiosks are more appropriate than buses for accessories ads. “Bus sides feel different than billboards. I think of buses for jeans and fragrances, and sportswear and accessories for phones.” Al Shapiro, vice president of marketing at Liz Claiborne, doesn’t buy into the notion that there are too many media choices. “No, we’re always looking for new media options. The more the merrier,” said Shapiro. To determine which magazines to advertise in, Shapiro evaluates whether the title fits in with the brand and provides the company with adequate reach and impact. “We also look at the editorial environment,” he said. With a fall budget up 15 to 20 percent, Lori O’Rourke, Claiborne’s vice president of advertising, said, “We’re doing the same amount of magazines, but doing more impact units of four to eight pages.” In addition to the core fashion magazines, Claiborne’s mix for fall includes Talk, Martha Stewart Living, More and Redbook. “We challenge [magazines] each season. It includes added value and positioning guarantees,” said O’Rourke. Shapiro said Claiborne has had success with in-store fashion shows, sweepstakes and small wardrobing events. “We look for events that connect the national advertising message with point of sale.” One way Claiborne measures an ad’s effectiveness is by running 800 numbers and its web site address on all its ads, said Shapiro. “The [Liz Claiborne] web site has become a major component of our ad program. It gets 129,000 visits a month,” said Shapiro. The web is enticing to most fashion brands, but some feel there are still unanswered questions. “E-commerce and the Internet are definitely the next prime area of advertising, but the big unknown in this arena is how much of one’s dollars to spend, as well as a general lack of broad-based industry standards for pricing, venues, etc., especially in areas such as fashion,” said Donna Cristina, partner in Dente & Cristina, an ad agency that handles Max Mara and Marina Rinaldi. “A lack of independent auditing reports such as MRI and ABC adds to the confusion. In the future, Internet media planners may have their own role in agencies,” said Cristina. Lloyd Weber, media director at Levi, Strauss & Co., was hired a month ago to evaluate media use for all Levi’s brands. “As the company gets more consumer-focused and more marketing-oriented, they decided to bring someone in-house. The company realized that maybe there are some opportunities to leverage the brands, to have a broader look at things. Something might work for Docker’s and Levi’s.” Weber said that when he evaluated media, he would try to analyze who they were targeting, how efficient they were and whether they were in touch with consumers’ lifestyles. “Fragmentation makes your job more difficult, but it allows you to target with a laser-like focus to heavy users and mind-set,” he said. “As you get more focused, it makes the analysis tougher. Fragmentation is a good thing, not a bad thing. Based on what’s happening in society, consumers have so many more choices. We’re becoming a less cohesive society. You see lower average ratings on TV, but it’s now spread across so many choices of viewing.” In the old days, he recalled, “you had three choices if you wanted to advertise on TV — ABC, NBC and CBS, and NBC was younger than CBS. Now there are so many options, with Fox, cable…” Weber said Levi’s would work with magazines on added-value programs. “I think we’re looking for added-value opportunities to reinforce the brand’s soul and what the [brand’s] personality is. In every event, we look to bring consumers to retail and reinforce the brand’s image,” said Weber. But some executives said they bypassed value-added programs. “It’s too aggravating to do in-store promotions, and it’s too complicated; it’s a waste of time and money,” said Sam Shahid, owner of Shahid & Co., an ad agen-cy here that works for such clients as Tse, Perry Ellis, Abercrombie & Fitch and Versace Men. “We just direct our dollars. I know exactly where I want to be,” said Shahid. Usually, he ignores the niche magazines. He said the young guys who were reading Surfing or Skateboarding were looking for articles on items that pertain to that. “We don’t go after smaller publications; it doesn’t fit. You don’t look good in those magazines. It’s all in the company you keep.” Sometimes he supports a magazine such as Wallpaper when it starts out. “It has an audience. Do we stay there? No. We go into special issues and help them out and leave,” said Shahid. Besides print, Abercrombie & Fitch relies heavily on its own quarterly to drive business. “It’s been extremely successful,” said Shahid. According to Peter Arnell, chairman of Arnell Group, which does the advertising for Movado Group, Samsung and Tommy Hilfiger, “There are more types of media to localize communications, which is a good idea.